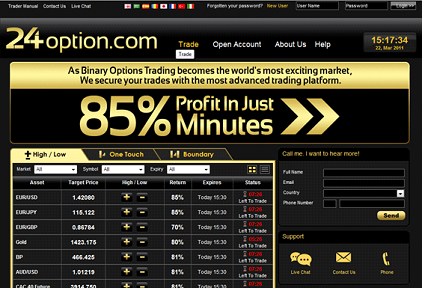 BinaryOptionsNow – 24Option.com, the world’s largest digital options trading platform, now offers traders six different ways to trade binary options. This gives your trading strategy unparalleled flexibility and provides you with even more way to make profitable trades. The six different types of trades that you can execute are high/low, above/below, touch/no touch, high yield touch, boundary, and high yield boundary trades. For more information on how each of them fit into your binary option strategy, keep reading. High/low trades are the most common and easiest to use binary options. The option is written at the current market price. You will trade based on whether the underlying asset will be higher or lower than the current market price at the expiry time. High/low options are available for every underlying security that 24Option offers. These options are the easiest place to get started and profitable, and they offer consistent, good returns. Similar to high/low trades are above/below trades. Above/below trades take a security and give you a probable market price. This price is different than the current price of the security. You will then have to decide whether the price of the underlying asset is going to be above or below that price at the expiry time. Currently, 24Option only offers above/below options for the EUR/USD currency pair. The prices are harder to hit, but if you do get a large jump, the return on the option can be over 350%. Touch/no touch options are options that name a market price. You have to decide whether the price of the underlying asset is going to reach that target price by the expiry time. If the price does reach the touch price, the touch options are successful; if it doesn’t the no touch options are successful. The difference between touch/no touch and high/low trades is that the price doesn’t have to be maintained until the expiry time. As long as the price is reached before expiry, it doesn’t matter what the price of the asset does afterwards. Because of this, touch options offer a slightly lower return than high/low options. 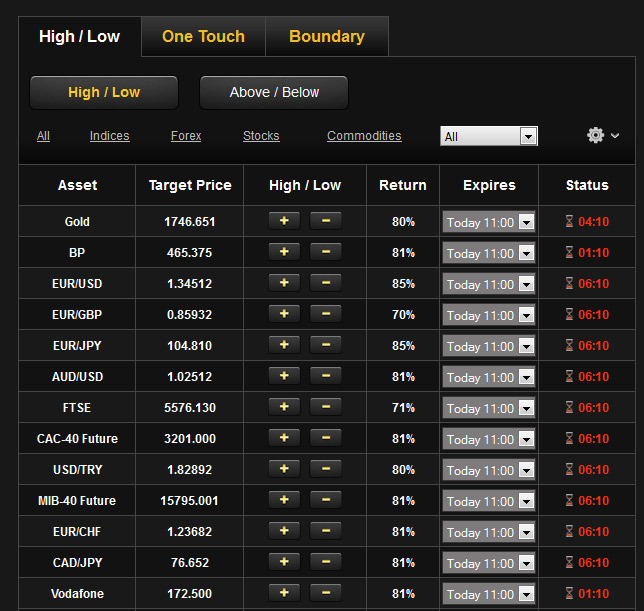 Currently, 24Option offers major currency pairs, large indices, and commodities as touch options. High yield touch options are the same as touch options, but the prices are much harder to reach. Because they have a slimmer chance of happening, the returns on high yield touch options are between 200% and 350%. Unfortunately, only the EUR/USD currency pair is offered as a high yield touch option and you can only trade on the touch, not on the no touch. Boundary options are written with two target prices that form a boundary for the security. At the time of expiration, the price of the security will either be inside or outside these boundary lines. If the price is inside, the in trades are successful, if the price is outside the boundary, the out trades are successful. Returns on boundary options are similar to the returns offered on touch/no touch options. 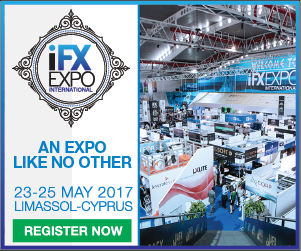 Currently, 24Option allows you to trade major currency pairs, oil, gold, and indices as boundary options. High yield boundary options are, once again, the same as boundary options. However, the prices are harder to achieve and you can usually only trade on one side of the boundary. To compensate, returns for these options are around 200%. Currently, only the EUR/USD currency pair is offered to trade as a high yield boundary option. The six different types of options offered at 24Option gives you unmatched freedom in your binary trading. 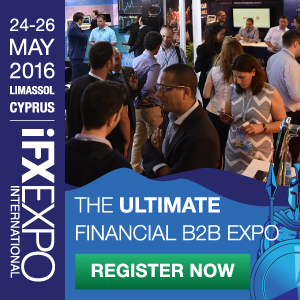 Sign up for an account today and see how they can help take your trading to the next level.